Official Facebook profile for the now defunct metal band Inhuman. 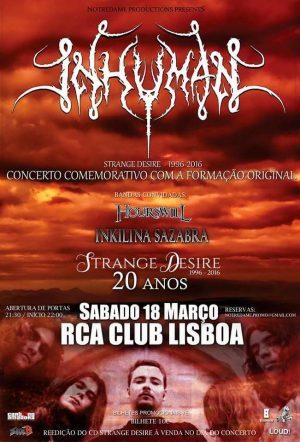 Inhuman were formed in December 1992, in Silves, the ancient capital of the Moorish kingdom of Al-Gharb. After one year of rehearsals, the first live appearance reveals an overwhelming reaction of the crowd, so, the shows succeeded all over the country. In 1995, the band decides to record the first studio recording and chooses the RecnRoll Studios in the north of the country. This demo (Pure Redemption) was produced by Luís Barros (Tarantula) and the band. 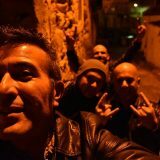 After the release of Pure Redemption, Rogério Sequeira joins as the new bass player (the bass was previously recorded by the guitarist João Pedro). This demo was a big achievement for the band and the press and the public soon recognized their potential. The diversity and quality of Inhumans early sound made their debut considered the best demo released in 1995, by most of the Portuguese and international media. 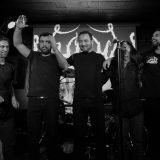 As a consequence of the excellent reviews many recording companies wanted to re-release the Pure Redemption demo, as the French independent Adipocere Records, unfortunately, there was no agreement with the band, which signed with the Portuguese Art Music for their first album. Strange Desire was recorded in December 1995, repeating the experience at the RecnRoll studios with Luís Barros. The album was later released in May 1996 and once again the critics made excellent reviews all over Europe. The songs played in various radio shows and the band featured in some music magazines which gave it a greater exposure. In Portugal the concerts increased and the band got a big following all over the country. 1997 was a very important year for Inhuman, with the signing for União Lisboa, which resulted in the second album. Foreshadow was recorded and mixed at the Square Centre Studios, Nottingham, England, produced by Simon Efemey, Known for his previous works with such bands as Paradise Lost, Pantera, Cancer, Therapy, Pitch Shifter, Napalm Death, Amorphis and engineered by Russ Russell. The mastering took place at the famous Battery Studios in London. Foreshadow was released in May 1998 and the response achieved the expectations of both public and the band. The album was distributed internationally by Dream Catcher Records. With this release the band also recorded a video clip for the song Divinity. The filming occurred at Minas de S. Domingos, and was directed by José Pinheiro. The video gave the band the possibility of opening the doors for some television appearances in some international music channels. In July 1998, after the beginning of the first live shows regarding the promotion of the Foreshadow album, Pedro Garcia leaves the band. 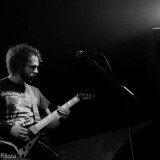 The substitute is Hugo Lopes (Bell Witch), which gave the band a new strength for the next live shows all over Portugal. In 1999 started the writing of new songs, for a third album, which was never completed or released due to problems with the record company. This dark period got even worse, when Hugo Lopes leaves due to musical divergences. Pedro Fialho (ex-Please Remember) replaced the previous singer, and the band worked in new songs, some of them where even recorded in studio, but once again things didnt work up and the band finished all its activities some time later in 2002. … 2008 is the year of the RETURN… In 2009 the band recorded a demo with 3 tracks in order to find a new record deal. Carlos Sobral – bateria, programações ,voz. Criado a 15 de Janeiro de 2010, o projeto INKILINA SAZABRA é formado por Pedro Sazabra (voz), Carlos Sobral (bateria, programações, voz de apoio), César Palma (guitarra) e Paulo Dimal (teclados).